May 2018 will be a difficult but very interesting and promising period in the life of Sagittarius. The influence of the astrological situation on the members of your Zodiac sign will endow you with endurance and steely patience, thanks to which Sagittarians will be able to overcome all obstacles that will stand in their way. No serious tests on the fate of representatives of your Zodiac sign will fall upon you this month, but you have to gather strength to resolve a series of everyday troubles, which, every now and then, will appear like mushrooms after the rain. Be advised that most of these worries will in the end be pleasant and will bring a lot of satisfaction. 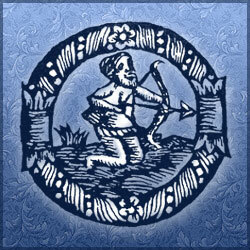 The mood of Sagittarius, and their success, will depend directly on how they perceive such a turn of events. If everything will be viewed in black and white, then you are unlikely to achieve anything at all this month; but, if all the fuss becomes just another entertainment, an opportunity to communicate, get acquainted, spend time in a pleasant company, or learn something new, then soon the gate to happiness and success will open before you. The early portion of May 2018 will bring Sagittarius many reasons for joy and fun. Life will be sufficiently saturated with various events that will make it brighter, more dynamic and more interesting. Representatives of your Zodiac sign, under the influence of the stars, will radiate an incredible attraction and like a magnet attract the attention of potential fans. Such excitement will give Sagittarius courage and confidence in their own attractiveness, which will help them to reveal their strongest business qualities and reach great heights in the professional sphere. Sagittarius, radiating inner strength, will successfully negotiate with business partners, convince others of their own rightness, and pull them along. That black cloud, which prevented Sagittarians from succeeding, disappears without a trace. Now, Sagittarius will more resemble a brave warrior-conqueror, who is not afraid to enter into battle with the enemy who fought in his territory. Sagittarians will learn to maneuver among the sharp turns and twists of fate, which will greatly enhance your competitiveness. The middle period of May 2018, under the harmonious impact of the astrological situation, will pass under the banner of self-improvement and personal growth. At the beginning of the month, Sagittarians' self-esteem increases and strengthens, but this is not enough to feel the power to conquer new peaks and achieve success. Therefore, the main efforts of representatives of your Zodiac sign will be aimed at self-education and hone new skills. During this period, Sagittarians will have an excellent opportunity to discover their potential and make the most of it, gaining valuable experience and moving closer to their own goal. During this period, many Sagittarians will reassess their system of life values, and reconsider their views on life. Sagittarians look at their lives from the outside, which will help them understand themselves and correctly prioritize them in order to avoid annoying mistakes in the future. The final weeks of May 2018 will be one of the most striking and memorable periods in the life of Sagittarius. In the final period of the month, under the influence of the astrological situation, representatives of your Zodiac sign will be delighted and proud to bathe in the rays of glory and success. All the work done earlier in this period will give excellent results, on which Sagittarius did not dare count. But, do not let down your vigilance prematurely, because this is only the beginning of your journey, and you are still a newcomer to this vital field. Be more careful and attentive to what is happening around you. Gain experience, study new directions, try your strength in other areas and activities. Strength and energy will add to your family, where you are loved, valued and respected. Give close people more attention, take care of them; build a solid foundation that will never fail you under any circumstances.